Joh Lang started this site in 1996, collecting and presenting most of the materials in a tribute to both famous and lesser known musicians. Over the years that followed, new tributes have been added with the help of countless submissions and contributions. Joh is no stranger to rock and roll, starting in the early 1960's he has played with and met countless musicians through the years. Joh is based in New Zealand and is a luthier of the highest order, creating hand crafted guitars that are highly sought after across the globe. 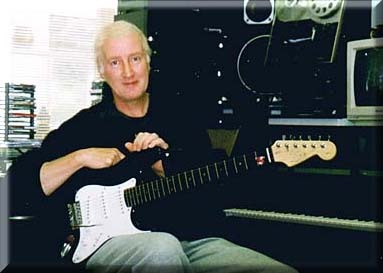 Joh Lang, owner and founder of Langcaster Guitars. Joh has created a line of guitars and basses made from high density, hand crafted, high sustain, 35,000 year old New Zealand Kauri wood. 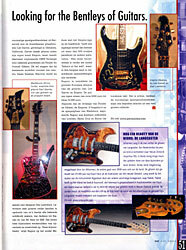 These have been called the "Bentley" of guitars, with rave reviews and testimonials from around the world. 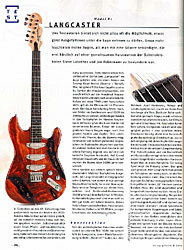 Visit Langcaster Guitars for more information, photos, videos and even audio samples of the instruments. I would like to dedicate this site to my friends and band mates. Ary Groenhuijzen and Hans Braggaar. Ary was the founder member and keyboard player of the Dutch Band from Amsterdam "The Teddy Bears " and I became the lead singer. In the early 60's I was the President of the Dutch Buddy Holly Appreciation Society supported by Buddy's parents. On the anniversary of Buddy's death, the 3rd of February, I organized a Winter Dance Party for fan club members. A local band "The Mystics" was hired and since no one in the band knew any Buddy Holly songs I offered to sing. Ary of "The Teddy Bears" was in the audience and a few days later he knocked on my door and asked me to join his band. We had a very successful 5 years and a lifelong friendship. After this time I formed the "Misfits". I carried on as a photographer and publisher of "Rock" music and moved to New Zealand and published "PoP Score" magazine and managed some local Rock bands. This gave me the opportunity to meet and photograph many of the world's biggest rock stars. Now 30 years later I am back to where I started, bringing a tribute to Buddy Holly and Ary Groenhuijzen, the two people who changed my life. Ary died on 15 July 1997 at the age of 51.
guitar player of, "The Misfits Four." Hans died on May 5,1999 at the ageof 52. His talent and blue Fender I'll always remember.
" We'll Always Remember "